Earlier, a diplomatic source told Sputnik that the United Kingdom’s mission to the United Nations had requested to hold an urgent UN Security Council meeting on Friday regarding the escalation of tensions in Libya. An urgent UN Security Council meeting regarding the situation in Libya has been called for Friday at 3:00 pm (19:00 GMT), the United Kingdom’s mission announced. 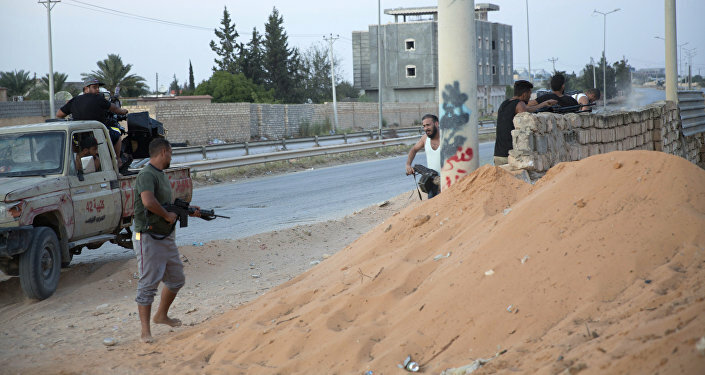 Earlier on Thursday, the Al-Arabiya broadcaster reported that Libyan National Army (LNA) Field Marshal Khalifa Haftar had ordered his troops to launch an offensive on Tripoli to liberate the city from terrorists. Haftar issued the order after the LNA took control over cities of Surman and Garyan that previously were under the authority of the UN-supported interim Government of National Accord. Haftar reportedly called on the LNA forces to ensure the safety of foreigners in Tripoli and not to shoot at civilians. The UN Security Council is expected to convene for closed session consultations on Friday, the diplomatic source said. On Wednesday, the Government of National Accord declared a general military alert after Haftar-led eastern forces announced they were moving to western parts of the country. Libya has been embroiled in a political crisis since National Transitional Council forces, supported by NATO, murdered the country's former head, Muammar Gaddafi. The country has been divided between the LNA-backed parliament, elected in 2014 and based in Tobruk in the east and the Government of National Accord, established on an initiative of the United Nations, that previously controlled Tripoli.